On this last day of the year I thought I’d take stock of some unfinished business, namely my unfinished projects from 2011. The list is short and consists of a pair of mitts, a scarflet, and a bag. Not too bad. I don’t like the way theses mitts flare out and curl at the ends which is why they are still unfinished. I will rip out the finger and thumb edges and finish them with a simple ribbing. I started this on the flight back from Vegas in October. I’ve worked on it some since then and have about 16 inches knitted with 9-10 more inches to go. Christmas knitting prevented me from finishing this. I hope blocking the finished scarf will correct curling at the edges and keep it from curling when worn. Other than that one concern, I am loving the colors and the stitch. This one is for my sister. Love the colors: Cascade 220 in Primavera and Jet. I used these two colors on my bag along with Ruby. Same pattern as before but I cast on 21 stitches per square instead of 17. The original pattern calls for 25 stitches per square but that makes a bag too big for my taste. And too heavy for my shoulder. The pattern is relatively mindless knitting though I had to rip out part of a square when I discovered I was mindlessly doing stockinette stitch (knit one row, purl the next) instead of garter stitch (knit all rows). Easy enough to fix. 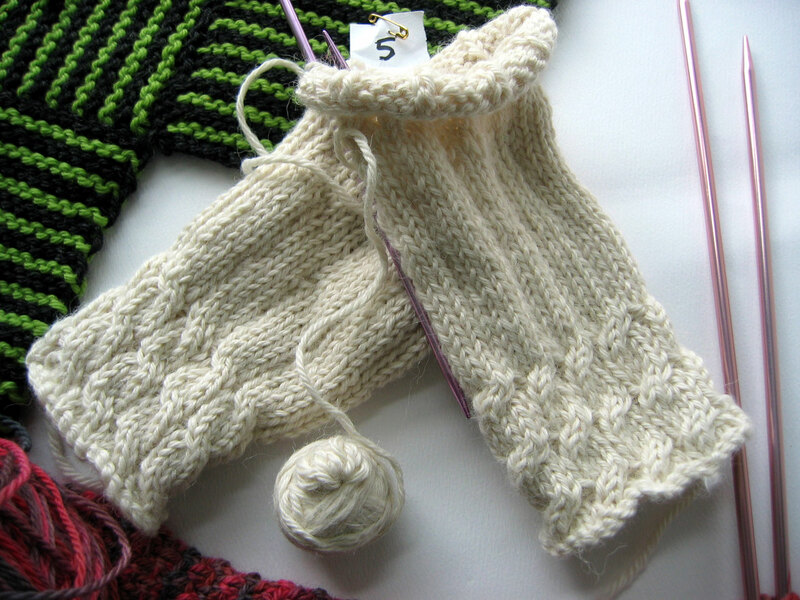 The mitts should take an hour or two to finish. The bag is a bit more time-consuming. 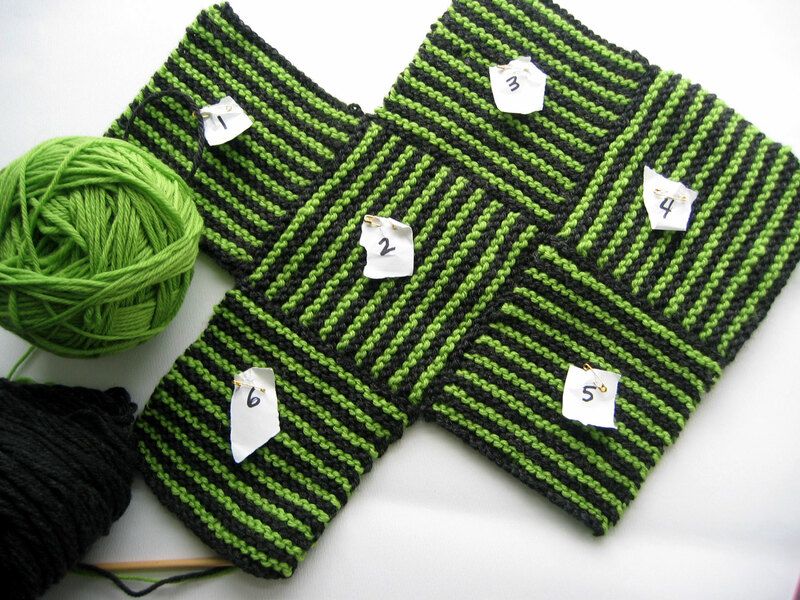 Each row takes me about one minute to knit and each square is 42 rows. It’s roughly 42-45 minutes per square provided I don’t accidentally purl instead of knit. 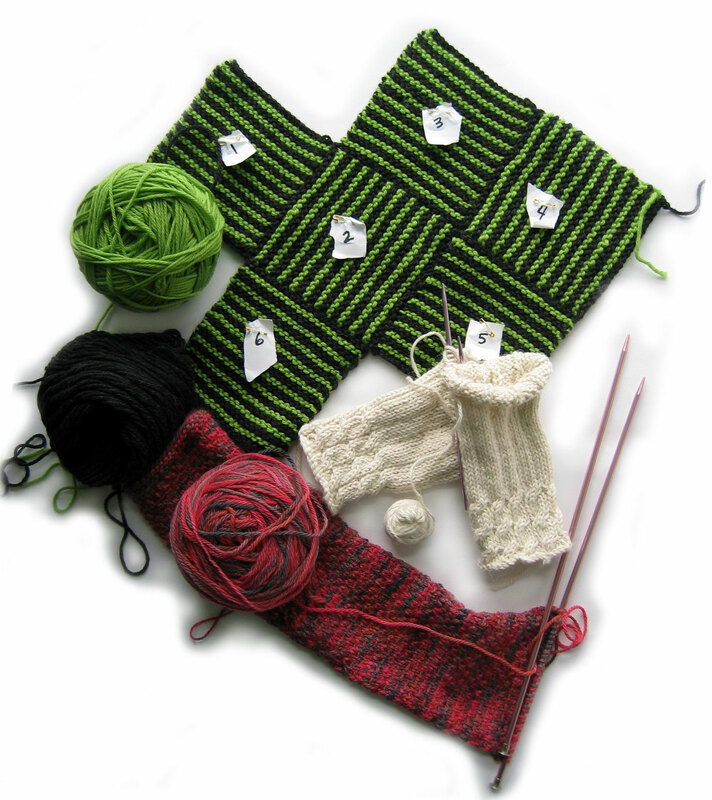 I have 6 out of 22 squares finished and I’m seaming it together as I go. Easy to do while watching a movie or football game. The scarf is, well, just a scarf. It’s for me and I’m not in a hurry to finish it so it will be at the bottom of the list. Do you have any unfinished business this year? Will you finish what you started before casting on something else? Congratulations! You have a very short list. I on the other hand…..have 1 quilt that needs binding, 1 quilt that is sandwiched together that needs quilted and bound, 10 burp cloths that are partially cut out, a fall wall hanging that I have looked at but not done anything with, fabric for a crib quilt that needs to be sandwiched and quilted and bound. Shall I continue? Just say STOP NOW! Aaarrrggghhh! Now that the holiday are over I hope to get started AGAIN on these projects. What I really need is to make myself a space so I can keep it out and that will be easier to work on it. Hhhmmmmmm. All my business is unfinished. Well, that’s not exactly true, but those socks are still just heels and cuffs (and I’m talking about the most recent pair – not the ones I destroyed.) And yes, of course I’ll start new stuff. I always do. I’m an idiot with ADD, or ADHD, or whatever that is (perhaps presenile dementia?) and I just go with the flow. Right now I’m flowing with punch needle, but surely that will wane as well…though I hope not. Happy New Year.